David McKee was born in Devon and studied at Plymouth Art College. In the early part of his career, McKee regularly drew and sold humorous drawings to magazines and newspapers such as The Times Educational Supplement, Punch and the Reader’s Digest. David McKee has written and illustrated over 50 picture books for Andersen Press and has penned a number of children’s classics including King Rollo, Mr Benn, Not Now Bernard and Elmer the Patchwork Elephant. David loves to paint and now lives in the South of France but regularly visits the UK. 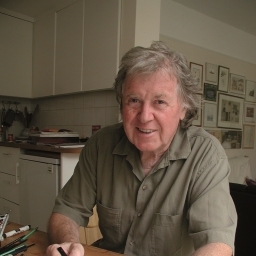 One of the World Book Day 2015 Authors David McKee is one of the best known illustrators of picture books, having created acknowledged modern classics such as Not Now, Bernard, Elmer the Patchwork Elephant, and Mr Benn, Gladiator. His books are published in many languages throughout the world, and many of them have been adapted for television. He was born in Devon and now divides his time between the South of France and London. Have you seen Elmer’s Photo Patchwork, an innovative activity-based app that encourages creativity and fun? Elmer the Patchwork Elephant is an elephant who stands out from the herd, and Elmer’s app is different too. It doesn’t keep children glued to the screen, it makes them look up, look around and get inspired by the world. The only limit is their imagination. By using an iPad or iPhone’s camera to take photos of interesting colours and textures, kids can add them to an elephant’s patchwork pattern. Aimed at children aged 3+. Elmer’s Photo Patchwork app is available for £1.99 from the App Store for iPad and iPhone. Find out more at www.elmersapps.com and view the app preview video here. Out walking, Elmer the Elephant is in a reflective mood, taking his time to soak up the sounds, smells and sights around him. He spots shapes in the clouds and in the sandstone rocks, he listens to the noise of the river crashing over a waterfall, notices the raindrops in a spider's web that look like sparkling diamonds and smells the scent of wild flowers. The other animals hurry past, far too busy to stop and enjoy these natural wonders. Fortunately Elmer meets his cousin Wilbur and they both stand happily together to watch the night-time draw in. This is a gentle introduction to mindfulness, a celebration of being in the moment and making time to appreciate the world around us. Elmer the much-loved patchwork elephant is in a particularly playful mood in this story. His young friend Rose is humming a catchy tune, and soon all the animals are singing along. In fact, the tune is so catchy, they just can’t get it out of their heads. Fortunately, Elmer comes up with a solution. Whether Elmer is an old friend, or they are meeting him for the first time, young children will love this typically funny and surprising story. David McKee’s illustrations always dazzle, and his jungle is as vibrant and busy as ever. The wonderfully colourful story of Elmer the patchwork elephant has been a nursery favourite since this first book was published in 1989. A modern classic, the story of Elmer is known to millions, and continues to be one of the biggest selling children's books ever, having sold over 2 million copies around the world. The subtle message is that it is OK to be different, and combined with the vibrant colour and cheeky humour of the main character, it’s an essential bedtime story. Included with this new picture book edition is a cd of the story. This colourful picture book is known to millions and it's subtle message - that it is Ok to be different - has made this first tale about everyone's favourite patchwork elephant a classic must-read for every bookshelf. Little hands will love turning each sturdy page and meeting favourite friends from the world of Elmer the patchwork elephant. Join Elmer, everyone's favourite patchwork elephant, and his jungle band for a noisy day. The sound buttons are perfect for little fingers and help bring this charming Elmer story to life. Rain or no rain, Elmer is going for a walk. After being cooped up in a cave with his herd, he longs for a bit of fresh air and some peace and quiet. But peace and quiet is going to have to wait - when Elmer goes outside, he discovers the rain has caused a flood. Can brave Elmer work out a way to save a stranded young elephant? A gorgeous soft feel board book with round corners, perfect for sharing with toddlers. The wonderfully colourful story of Elmer the patchwork elephant has been a nursery favourite since this first book was published in 1989. A modern classic, the story of Elmer is known to millions, and continues to be one of the biggest selling children's books ever, having sold over 2 million copies around the world. The subtle message is that it is OK to be different, and combined with the vibrant colour and cheeky humour of the main character, it’s an essential bedtime story. To see other Elmer titles click here. Bestselling Elmer the patchwork elephant is back for a new adventure. All the animals in the jungle are terrified! There is a strange roaring noise and no one knows what it can be. Soon, all the animals are stampeding as far away from it as possible. All except for Elmer… Bravely, Elmer sets out to find the source of the noise. And makes a very surprising discovery. A great new adventure for Elmer and his animal friends. Have you seen Elmer’s Photo Patchwork, an innovative activity-based app that encourages creativity and fun? Elmer the Patchwork Elephant is an elephant who stands out from the herd, and Elmer’s app is different too. It doesn’t keep children glued to the screen, it makes them look up, look around and get inspired by the world. The only limit is their imagination. By using an iPad or iPhone’s camera to take photos of interesting colours and textures, kids can add them to an elephant’s patchwork pattern. Aimed at children aged 3+. Elmer’s Photo Patchwork app is available for £1.99 from the App Store for iPad and iPhone. Find out more at www.elmersapps.com and view the app preview video here. Elmer, the well-loved hero of so many titles, is back for a charming new adventure among the whales. Elmer and his cousin Wilbur set off to the sea to catch a glimpse of the whales as their grandfather did before them. When the crocodiles suggest travelling along the river by raft the young elephants think it is a brilliant idea! Soon the raft is travelling dangerously fast! How will Elmer and Wilbur stay safe? Luckily, they reach the sea and the kind whales look after them. One of the most treasured characters in children's picture book publishing is of course Elmer, the elephant who was different. Different because he is a patchwork elephant. Join him in five timeless, exciting and colourful adventures that will be enjoyed by parents and toddlers alike. This beautiful hardback treasury is the perfect gift and an essential in the nursery bookshelf. To view Elmer's full bookshelf then click here. Multi-coloured Elmer is everyone’s favourite elephant! This first collection of four board books includes Elmer’s Weather, Elmer’s Friends, Elmer’s Day and Elmer’s Colours. Perfect as an introduction to each topic! Elmer the colourful patchwork elephant has been a nursery favourite since this first book was published in 1989. This is a special 25th Anniversary edition. Andersen Press invites YOU to join in with Elmer’s Anniversary Parade and ‘show your colours’. You can hold an Elmer parade in a library, a bookshop, a classroom, at home, outside – anywhere! Download an Elmer’s Parade Pack here which includes craft activities, games, colouring sheets, bunting and lots of ideas for holding your own Elmer parade! January 2014 Book of the Month Best-selling Elmer, the only patchwork coloured elephant in the jungle, loves playing with his friends. This time, Elmer teams up with Snake to outwit all the elephants and all the other animals who want to play a trick on him. Elmer is looking pale. Is he really poorly as the elephants think? It could be that Snake is helping him. But Snake is playing tricks of his own! Luckily, everyone can enjoy the last laugh! This is a great addition to the nursery bookshelf. Touching on bullying in a very positive way, this wonderful story shows the colourful elephant, Elmer at her very best, cajoling and persuading all the birds of the forest to stand up against being bullied and needless to say Elmer succeeds in a very clever way, so that no one ends up upset. A magical masterpiece from the creator of Not Now, Bernard, Elmer and Mr Benn. This classic David McKee text is wonderfully re-illustrated in full colour....a strong story with a very good moral: magic has its place but doing things for yourself ismore fulfilling. Melric the Magician returns as this classic David McKee text is wonderfully re-illustrated in full colour. Elmer the multi-coloured elephant is one of the best-loved characters of children’s fiction. Now it is nearly time for the visit of the magical Papa Red and, always kind and thoughtful, this time Elmer helps to make Christmas magical for all the young elephants – and to get presents to children who need them most. David McKee’s elephant world and especially the charming Elmer are as delightful as ever. Elmer, the best-selling and most beloved elephant, is back for a new adventure. When Super El turns up with his super-costume all torn, Elmer knows just the person to fix it. But getting Super El to Aunt Zelda without the other elephants seeing him and laughing takes some clever Elmer trickery. As ever, loveable Elmer helps a friend in need in this entertaining story set in the world of the elephants. The elephants are not happy - the hippos have come to share the river because theirs has dried up. When they complain to Elmer that the river is over-crowded, everyone's favourite patchwork elephant sets off to see if he can find a solution. This book is a wonderful celebration not just of the fun that can be had when everyone “all joins in” but also of Elmer’s 20th birthday. It’s Elmer Day. In their excitement about getting ready for it, the elephants forget about the racket they are making and so annoy all the other animals in the jungle. Luckily Elmer has a plan and soon all the animals in the jungle are celebrating Elmer Day in a feast of multi-coloured styles. Here at Lovereading4kids we’ve chosen just a small selection of Elmer titles to help celebrate Elmer’s 20th birthday, all of which toddlers will love for every book has a wonderful story and also every book is a great way to learn the colours of the rainbow and many more too!!! To view other titles click here. Creator of the bestselling Elmer and Not Now Bernard, David McKee has come up with a thought-provoking story about being happy with your lot. Denver is very rich and very philanthropic. He is kind and generous to the villagers and everyone loves him for it. But money is not really important to him. He just wants to paint. When a stranger tells the villagers that Denver has too much and they should have more, everything changes – but not for the better. David McKee uses different perspectives in brilliantly imaginative ways to tell this moving and entertaining story. Everybody’s favourite elephant Elmer is back for another hilarious adventure. This time he boasts that elephants can never be blown away but all too soon he is dramatically proved completely wrong! How Elmer survives his adventure and shares it with his friends is a wonderful new story about a very special patchwork elephant. Do you have all the Elmer titles. Why not check right here? Just launched is an Elmer's Special Day App! - click on the button on the right to find out more. This book is a wonderful celebration not just of the fun that can be had when everyone “all joins in” but also of Elmer’s 20th birthday. It’s Elmer Day. In their excitement about getting ready for it, the elephants forget about the racket they are making and so annoy all the other animals in the jungle. Luckily Elmer has a plan and soon all the animals in the jungle are celebrating Elmer Day in a feast of multi-coloured styles. Here at Lovereading4kids we’ve chosen just a small selection of Elmer titles to help celebrate Elmer’s 20th birthday, all of which toddlers will love for every book has a wonderful story and also every book is a great way to learn the colours of the rainbow and many more too!!! To view other titles click here. How strangers can become friends is the theme of this entertaining story about Elmer, everyone’s favourite patchwork elephant and this edition comes complete with audio CD. This time, Elmer and his friends in the jungle help Kangaroo find out that he can jump after all. At first the Kangaroos seem strange but soon, everyone in the jungle is used to them and they all become good friends. Books featuring the wonderfully colourful elephant called Elmer are essential bedroom companions. The CD is read by Ray Brooks and comes complete with original music and sound effects. Perfect for toddlers. To see other Elmer titles click here. How strangers can become friends is the theme of this entertaining story about Elmer, everyone’s favourite patchwork elephant. This time, Elmer and his friends in the jungle help Kangaroo find out that he can jump after all. At first the Kangaroos seem strange, but soon everyone in the jungle is used to them and they all become good friends. Books featuring the wonderfully colourful elephant called Elmer are essential bedroom companions. There is also a book and CD edition complete with original music and sound effects. Perfect for toddlers. To see other Elmer titles click here. Loveable Elmer has a new trick up his sleeve! When the elephants complain about the cold, Elmer takes them on an adventure to the very top of the hill. Soon, the elephants have fallen in love with snow and they have delighted in the novel excitement of sliding on the ice. And, building a snow elephant and introducing them to a snowball fight, Elmer has some more tricks to show them. Elmer and his elephant friends show just how much fun you can have in the winter. With Elmer’s typical sense of mischief and fun, as all his friends and family are complaining that winter time is cold he persuades them to take a walk, but it’s not as cold as living on a mountain top. Elmer’s powers of persuasion are legendary and this story is a typically brilliant example. This edition comes with an audio CD read by Ray Brooks, complete with original music and sound effects. Perfect for toddlers. To see other Elmer titles click here. This is a great addition to the nursery bookshelf. Touching on bullying in a very positive way, this wonderful story shows the colourful elephant, Elmer at her very best, cajoling and persuading all the birds of the forest to stand up against being bullied and needless to say Elmer succeeds in a very clever way, so that no one ends up upset. To see other Elmer titles click here. Baby Elephant has lost his teddy, but unsurprisingly Elmer comes to the rescue. But when he hears someone shouting ‘Help, I’m lost’, is it Cousin Wilbur up to one of his practical jokes again or is it really lost teddy? Share it with your toddler to find out. To see other Elmer titles click here. Book and Audio CD. Baby Elephant has lost his teddy, but unsurprisingly Elmer comes to the rescue. But when he hears someone shouting ‘Help, I’m lost’, is it Cousin Wilbur up to one of his practical jokes again or is it really lost teddy? This edition comes with an audio CD, read by Ray Brooks and complete with original music and sound effects. Perfect for toddlers. To see other Elmer titles click here. Cousins Elmer and Wilbur have never seen a pink elephant until they meet Rose, who is lost and is looking for her herd. So Elmer and Wilbur set out to find Rose’s herd and when they do they get a huge surprise. As one expects from David Mckee this is yet another wonderfully colourful story that toddlers will love to share with parents, and children just beginning to read will devour for themselves again and again and again. To see other Elmer titles click here. Elmer has captured the hearts of young children for 20 years with the subtle message is that it is OK to be different. Combined with the vibrant colour and cheeky humour of the main character, this has become an essential bedtime story. To see other Elmer titles click here. The subtle message is that it is OK to be different, and combined with the vibrant colour and cheeky humour of the main character, this paperback and CD edition is a celebration of its continued popularity. To see other Elmer titles click here. Enjoy counting Elmer, everyone’s favourite patchwork elephant, and his friends from 1 Elmer to 10 birds singing in this attractive shaped board book. There are 3 delightful tigers daintily dancing while 4 contented lions lie dreaming under the stars. And there are fish and frogs and butterflies all just waiting to be counted too. If you’re looking for other great books for this age range then go to our Babies and Toddlers category. BOARD BOOK. Baby Elephant has lost his teddy, but unsurprisingly Elmer comes to the rescue. But when he hears someone shouting ‘Help, I’m lost’, is it Cousin Wilbur up to one of his practical jokes again or is it really lost teddy? Share it with your toddler to find out. To see other Elmer titles click here. Elmer’s adventures are an absolute must for reading at bedtime. Plenty of the feel-good factor and a lot of laughs too but also each one always provides a message; in this one it’s the importance of relationships across generations. Full of wit and fun this is sure to appeal to old and new fans of Elmer and all his friends in the jungle. A modern classic, this story about prejudice and conflict is more applicable today than ever. Once, elephants were black or white, and the two different tribes were at war, destroying each other until it seemed there were no elephants left in the world. However, one day the descendants of the peace-loving elephants emerge from the jungle, and they are all grey. Isabel’s rumbling tummy keeps her classmates amused. Everyone has advice about how to stop the rumbles but nothing seems to work. And just as well it doesn’t: when Isabel and her class visit the zoo, it’s Isabel’s amazing growling tummy that saves them from the escaping tiger. And then the tummy is silent. Or is it? If it is, just where does the new noise in the classroom come from? Loads of fun in this bright, bold and hugely entertaining story. Elmer’s Baby Record Book is the perfect way for new parents to record all the important milestones in their baby’s first two years: from first tooth to first step and beyond. In years to come children will love to read about all the special things that make them unique - just like Elmer, their favourite patchwork elephant! January 2010 Guest Editor Sophie Mckenzie on Not Now Bernard by David McKee 'This dark, rather depressing picture book opened my eyes to what was possible with children's writing. Adults often assume kids should be protected from what scares or threatens them in literature, but Not now, Bernard, helped me to realise that nothing needs to be taboo - its all in how you treat the material.' Chosen by Michael Rosen. An Andersen classic, this well-loved picture book story is about parents too preoccupied to notice their own child! They are so busy doing their own thing, that a monster can eat Bernard's dinner, break his toys, and even eat Bernard, without being noticed! An hilarious cautionary tale. It's Elmer's bedtime, but he still needs to find the perfect place to sleep. Bring the adventure to life as puppet-Elmer splashes in the lake with the hippos, tries to climb a tree with the monkeys, yawns, snuggles and waves goodbye. The cuddly puppet fits both big and little hands, making this interactive hand puppet book perfect for sharing between parent and child. Cyfres Elfed: Dyfala Pwy?/Guess Who? Elmer loves practical jokes, and so does his cousin Wilbur. Until, that is, Wilbur's practical joke leaves him high and dry and Elmer and the other elephants have to come to the rescue and bring him back down to earth. This classic story is now even more appealing to the youngest of children in a sturdy, padded board book format. Bernard's got a problem. He's found a monster in the back garden but his mum and dad are just too busy to notice. So Bernard tries to befriend the monster... and that doesn't go quite to plan. Loved by children, monsters and adults alike for almost 40 years, David McKee's iconic picture book is available for the first time ever as board book. The sturdy and stylish cased board book, complete with QR code for audiobook download, makes this a must for every nursery bookshelf. Limited edition of only 300 to celebrate the 35th anniversary, each signed and numbered by David McKee and accompanied by a portfolio containing a print from the book. Loved by children, monsters and adults for thirty five years, this beautiful limited edition slipcase is a must-own classic, with an introduction by former Children's Laureate Michael Rosen. Bernard has a problem. There's a monster in the back garden but his mum and dad are too busy to notice. So Bernard tries to befriend the monster... and that doesn't go quite to plan. The king's beloved pet troon has vanished along with all the other unusual pets in the palace, so he commands Melric to find the pets and fast! Melric joins forces with his cousin Guz, and they soon discover that Sondrak the sorcerer is behind the petnappings. Can Melric and Guz use their magic to outwit the cunning Sondrak? Mr Benn is Back! First published forty years ago, 'Big Top Benn' is one of a series of adventures by author and illustrator David McKee that inspired the legendary TV series that made Mr Benn part of the folk memory of the nation. Mr Benn is an ordinary man who has extraordinary adventures. In this entrancing story he swaps his bowler hat and black suit for an extravagant clown costume and finds himself transported into a world of big-top tents and circus performers. Through the inimitable charm and unique style of David McKee's original artwork this enchanting book brings to a new generation the glories of a golden age of children's book illustration and story telling. Big-Top Benn, along with Counting Birds and Noisy Neighbours, are our first books on a newly dedicated paperback list for children's picture books. Produced with the same care and attention to detail as all of our books for children, we hope this series will make the innovative and creative artwork, for which Tate Publishing has become so well known, accessible to even wider audiences. Count from 1 to 10 with Elmer, everyone's favorite patchwork elephant, in this amusing board book! Elmer is BIG. Bird is SMALL. Tiger is FAST. Tortoise is SLOW. Have fun looking at opposites from FRONT to BACK in this delightful board book! Elmer and the other elephants are waiting for the storm to end so they can see the beautiful, colourful rainbow. But something dreadful has happened: the rainbow has lost its colours! Elmer decides to give his own colours to the rainbow, but does that mean he will he lose them forever? The pink elephant herd, along with Elmer's friend Rose, are celebrating Old's one-hundredth birthday. But the celebrations take an unexpected turn when Old becomes stranded on a dangerous cliff top. Rose rushes to Elmer, maybe he knows a certain Super El who can come to the rescue? Following the welcomed re-release of Big-Top Benn comes another addition to the immensely popular collection of original Mr Benn adventures by author and illustrator David McKee. Published in 1967 Mr Benn - Red Knight was the first Mr Benn book ever written. It introduces the friendly bowler-hatted character who inspired the legendary TV series which made Mr Benn a household name. In this delightful story, Mr Benn finds himself transported into a medieval world where he assists an unfortunate dragon whose role as firelighter to the king is threatened by a greedy matchmaker. McKee's original artwork will entrance children of all ages in what is sure to become a cult classic for yet another generation of readers. 'The Tickle Ghost is somewhere near. Can you see him? Can you hear? Slowly creeping up the stairs. He'll try to catch me unawares'. But who is the Tickle Ghost? And is he real, or are Dad and Dylan just having a bit of bedtime fun? Elmer the colourful patchwork elephant has been a nursery favourite since this first book was published in 1989. A modern classic, this picture book is known to millions, and continues to be the strongest seller of the whole series, having sold over 2 million copies around the world. The subtle message is that it is OK to be different, and combined with the vibrant colour and cheeky humour of the main character, this paperback and CD edition is a celebration of its continued popularity. Read along with the audio CD included to bring the story to life! Elmer and the other elephants are waiting for the storm to end so they can see the beautiful, colourful rainbow. But something dreadful has happened: the rainbow has come out too soon and has lost its colours! Elmer decides to give his own colours to the rainbow, but to do that, he must find where it touches the ground. But what will happen to Elmer if he gives the rainbow his own colours? Will he lose them for ever? This is a classic story book about sharing and giving. Elmer is big. Bird is small. Tiger is fast. Tortoise is slow. Have fun looking at opposites right from front to back of this delightful book! Elmer the patchwork elephant has lost his ventriloquist cousin in the jungle! Elmer can hear Wilbur, but he can't see him. He searches high and low, but he can't find the cheeky black-and-white elephant anywhere. He's just about to give up and go home for tea when Wilbur stops him - he's been hiding up a tree all along, but now he's stuck! At last it's Elmer's turn to play a joke - would he really leave poor, hungry Wilbur stuck up the tree? Of course not! Soon, Wilbur is safely back on the ground, just in time for tea! Mr Benn always visits a costume shop, chooses a costume and goes through a special door. Then, as if by magic, he can travel to the era represented by the costume. This time he choosesa gladiator costume . . . and he is transported to Ancient Rome. But he has forgotten that gladiators fought one another. When the Emperor spots Mr Benn, he has him carried off to the arena. The worried gladiators there explain that they must fight, even though fighting is wrong. Will it be thumbs down for the alternative entertainment Mr Benn proposes? The perennial and well-loved classic picture book story about parents too preoccupied to notice their own child. Bernard's parents are so busy doing their own thing, that they don't notice the monster in the garden, nor see when the monster eats Bernard. In fact, the monster can eat Bernard's dinner, break his toys, and even say 'But I'm a monster', without being noticed! The elephants decide to play a trick on Elmer - and Snake suggests pretending to Elmer that he looks pale, to see if they can persuade him that he IS unwell. Meanwhile, Snake conspires with Elmer to trick the other elephants into thinking he is pale and unwell by covering Elmer in pale mud. It works, and the other elephants get rather worried about him. They ask Snake to give his advice - and he suggests tickling Elmer! Of course the dried mud cracks open, and the elephants realise that Snake has tricked them all. But they can't tickle Snake because he's very sensibly gone on holiday! One night, Elmer hears the sound of crying. It is baby elephant and he can't sleep because he has lost his teddy. Elmer offers to lend baby elephant his teddy for the night and to search for the lost teddy the next day. Elmer spends the whole of the next day looking for the teddy. His cousin, Wilbur gets involved in the search, and plays a joke on Elmer as usual, but one that helps Elmer find the missing teddy bear! This is an understanding story that everyone who has a teddy bear will relate to. Flaps and tabs reveal Elmer playing with his friends in a brightly coloured animal kingdom where leopards change their spots, crocodiles play hide and seek and Elmer splashes himself with a trunk full of water! Elmer the patchwork elephant has a busy day ahead of him. He likes to have fun squirting himself with water and playing with his friends. He often stops for a chat, and when he is hungry he stops for lunch -some fresh juicy grass. At night Elmer likes to count stars, but he never gets very far before falling fast asleep! The bold colours and simple rhyming story of ELMER'S DAY will enchant very young children, who will love learning the lines by heart. A humorous story in which a young boy is exasperated by his parents refusal to listen to him, so he decides to make them take notice.